Three 17th Century Chinese porcelain vases accidentally smashed when a museum visitor tripped are back on public display after being restored. The porcelain vases, from the Qing Dynasty, were broken in January 2006 when Nick Flynn crashed into them at the Fitzwilliam Museum in Cambridge. Specialist ceramic restorer Penny Bendall, from Suffolk, took six months to restore the pieces. They will now be housed in a specially designed case. 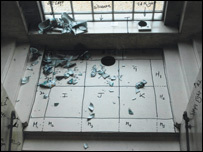 Before they were smashed, the vases had been on display for 60 years in a window recess on the staircase of the museum. They were smashed into hundreds of pieces when Mr Flynn tripped over his shoelace. The initial clear-up operation took two-and-a-half days. The restoration work has involved taping all the pieces together and then binding them with a special adhesive before a final polish and coating of enamel. The three vases are part of a set of five with an estimated value of between £200,000 and £300,000.